Deitsch, or Pennsylvania German, is a language spoken by at least 400,000 people in the United States and Canada. It’s closely related to the form of German spoken by about 1 million people in the Palatinate region of Germany. Despite all that, you won’t find any language learning programs or apps devoted to it–at least not currently! So if you want to learn this language, what materials do you use? I had to solve this problem for myself, so I’m going to share the learning materials I’m starting out with. In the future, I will share and also review other books and programs I use, but if you know of any I might not have seen yet, feel free to reach out and tell me about them! First off, Hiwwe Wie Driwwe is a Deitsch language newspaper, and in and of itself is a fantastic resource. Of particular interest is their series of YouTube videos hosted by Douglas Madenford. At the bottom of the page, you’ll also find a listing of live classes, if you’re lucky enough to live in or near one of the counties where they’re offered. 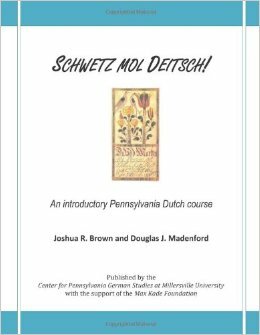 Madenford’s videos complement the book he co-authored, Schwetz Mol Deitsch, which as far as I have found, is the only workbook available on the Deitsch language. This is the first book I got to work with. So far, what I like about it most is that it takes advantage of the adult language acquisition style by giving you conversations in the target language to learn vocabulary from in context. This gets you thinking in your target language right off the bat, which is an important goal for language learners. No one book, of course, can teach you the entirety of a language. One thing you’ll need to do is supplement your vocabulary with dictionaries and other works. I’m starting with the Revised Pennsylvania German Deictionary by C. Richard Beam. I was lucky enough to pick this up inexpensively on eBay; if you watch carefully, you’ll periodically spot good deals. An older edition of the dictionary is available on Amazon. If you’re looking to make friends to practice your Deitsch with, Facebook has a number of groups for those who speak, or want to learn to speak, the language. Madenford lists some of them at the end of his introductory video; you can find more by using search terms such as Dutch, Deitsch, Mudersprooch, Amish, and Pennsylvania German. YouTube does have some additional Deitsch videos aside from Madenford’s. There are some minor dialect differences between different versions of Deitsch, but generally they are mutually intelligible. Another thing to be aware of is spelling differences, especially between older books you might find and modern ones. Feel free to reach out to me if you are learning Deitsch–I would love more friends to talk to!